CHICAGO, IL, February 23, 2011 — Chicago’s finest in professional boxing will once again be on display on Friday, April 1st at the UIC Pavilion as 8 Count Productions, HOME OF THE BEST IN CHICAGO BOXING, presents WINDY CITY FIGHT NIGHT 16, a sensational evening headlined by the highly anticipated return of super middleweight contender and longtime local fan favorite, Donovan ‘DA BOMB’ George. CHICAGO, IL, February 20, 2011 — Dominic Pesoli’s 8 Count Productions, HOME OF THE BEST IN CHICAGO BOXING, announced the signing today of three sensational young undefeated prospects to exclusive promotional contracts. 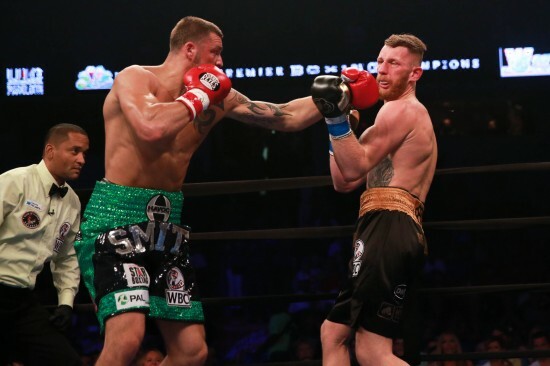 CHICAGO, IL, December 21, 2010 — Chicago’s WINDY CITY FIGHT NIGHT professional boxing series kicks off the New Year with a bang in its 15th installment as former WBC Lightweight Champion David Diaz returns to battle in the main event on Friday, January 28th at the UIC Pavilion. 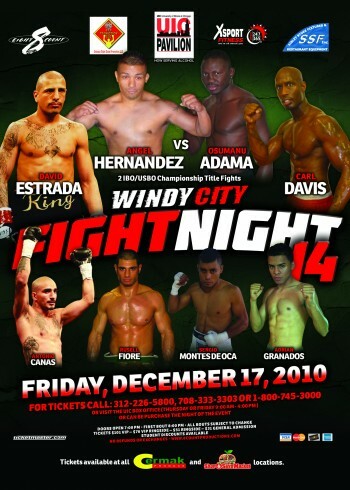 CHICAGO, IL, November 22, 2010 — Tickets are now on sale as 8 Count Productions and CFC Promotions presents WINDY CITY FIGHT NIGHT 14, an action packed evening of world class professional boxing set for Friday night, December 17th at Chicago’s UIC Pavilion.